MONTGOMERY– Twenty-eight Alabama counties, including Cullman, have been placed under a drought emergency in the latest Alabama Drought Declaration issued Tuesday afternoon. In addition, other areas of the state were moved to a more severe status in today’s updated advisory. 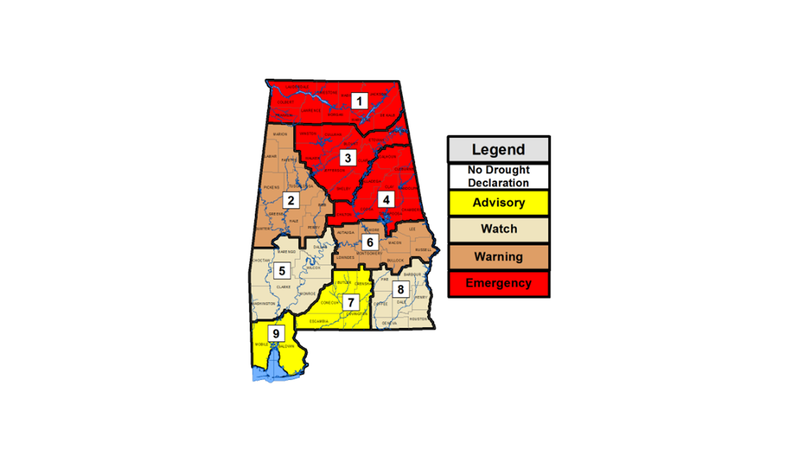 Region 2 in west Alabama moved to drought warning status, the second most severe category. Region 5 in southwest Alabama and Region 8 in southeast Alabama moved to drought watch status. Region 7 in south Alabama and Region 9 in coastal Alabama moved to drought advisory status. Region 6 in south central Alabama remained in drought warning status. ADECA’s OWR serves as the state’s lead office for drought planning, monitoring and response activities. During dry periods, the office works with local water systems, farmers, reservoir operators and industries to encourage water conservation to mitigate negative impacts associated with declining water levels. Part of that activity is convening regular meetings of the Drought Monitoring and Impact Group which collects and analyzes drought-related data and weather forecasts for updates Alabama drought declaration advisories and changes to Alabama’s input in the weekly U.S. Drought Monitor map. The group of experts includes the state climatologist, representatives from state and federal agencies, reservoir managers, municipal water systems, industry groups and others. The group is currently meeting about every two weeks and held its latest meeting Tuesday afternoon. The group’s next meeting is set for Nov. 1. As part of that effort, the drought advisories and a list of drought impacts and water restrictions throughout the state are available and updated constantly on ADECA’s website at www.adeca.alabama.gov/water. “These advisories are an important part of our state’s drought management process which emphasizes communication and coordination so that the public water systems in the state have the information they need to make decisions necessary for their systems,” OWR Division Chief Brian Atkins said. Click here to view a PDF copy of Tuesday’s drought advisory declaration.